The Northeast Greenland Ice Stream (NEGIS) provides a good illustration of the utility of interferometric synthetic aperture radar (InSAR) for studying ice dynamics and ice-sheet mass balance. This 700-km-long ice stream was discovered only in the mid-1990s when its presence was detected through the analysis of features visible in SAR imagery (Fahnestock et al., 1993). Soon after velocity on a central portion of this ice stream was mapped using InSAR (Kwok & Fahnestock, 1996). This was followed by a complete mapping of the velocity field using many ERS-1/2 ascending and descending passes (Joughin et al., 2000, 2001) as illustrated in Plate 74.1. The velocity map (Plate 74.1) reveals a pattern of organized flow extending deep into the interior of the ice sheet where the ice stream first manifests itself as a roughly 15-km-wide area of enhanced flow within about 100km of the ice divide. Although the speed is initially only about 10myr-1 greater than that of the surrounding ice, the enhanced flow is delineated by well-defined shear margins. A subsequent study has revealed that this flow onset is coincident with an inferred area of enhanced (10-15 cm yr-1) basal melt that may be the result of a geothermal heat flux 15-30 times the continental background average (Fahnestock et al., 2001). Downstream from the onset, the width of the ice stream increases to approximately 60 km, with flow speeds of 50-60myr-1. At this point, the ice stream is visible in ice sheet DEMs as an area of rougher surface topography. At about 300 km downstream from the onset, the flow begins to concentrate on the southeastern side of the ice stream. This narrowing of the main trunk results in an increase in speed to approximately 125 myr-1. 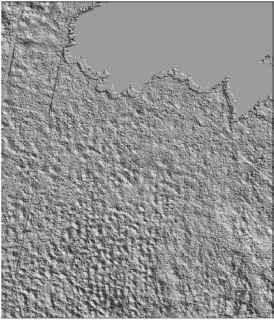 About another 240 km further downstream, the ice-sheet surface flattens out forming a large ice plain with significantly smoother topography. Just upstream of the ice plain, the flow divides with a southern branch feeding Storstr0mmen and a northern branch flowing through the ice plain to feed the outlet glaciers of Zacharis Isstr0m and Nioghalvfjerdsfjorden. 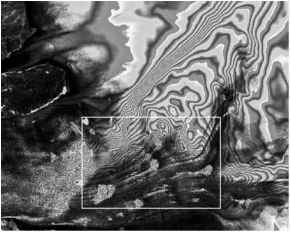 Although InSAR and other spaceborne sensors provide a detailed view of ice flow at the surface, they do not directly reveal the internal dynamical controls on ice streams. Inverse methods can be constrained by velocity and other data sets (e.g. thickness and elevation) to determine the basal shear stress (MacAyeal, 1992b). Such methods have been applied to the velocity data shown in Plate 74.1. The resulting inversions suggest that the bed beneath the ice plain is weak and can only support basal shear stresses in the range of 10 to 15kPa (Joughin et al., 2001). This weak bed is located in an area where the bed lies several hundred metres below sea level, and as a result, may be an area where weak deformable sediments have collected. 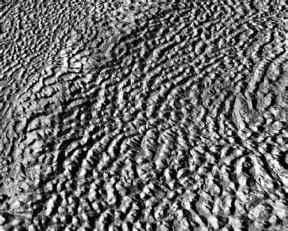 Thus, the ice plain, which represents a significant departure from a typical parabolic ice sheet profile, is probably the result of a weak bed without the ability to support larger driving stresses, and hence steeper slopes. The velocity data shown in Plate 74.1 have also been used in conjunction with ice thickness data from an airborne radio echo sounding system to estimate mass balance at several points along the ice stream. The results suggest that, at present, the ice stream is roughly in balance with its catchment and there is little or no significant thinning of the inland parts of the ice stream. Nearer the coast, Storstr0mmen is thickening following a surge in the early 1990s (Mohr et al., 1998). In contrast, laser altimeter results suggest thinning of a few tens of centimetres per year may be occurring on Zacharis Isstr0m and Nioghalvljerdsfiorden (Krabill et al, 2000). Although ice sheets are often considered to have dynamic response times measured in centuries or millennia, InSAR observations have revealed a surprising degree of temporal variability at decadal and subdecadal time-scales (e.g. Mohr et al., 1998). One example of such variation is the Ryder Glacier minisurge that took place over a few weeks in 1995 (Joughin et al., 1996). Plate 74.2 shows interferograms acquired in late September and October 1995. The much greater density of the fringes on the fast moving areas of the glacier in the October image indicate a more than threefold increase in velocity. Subsequent interferograms (not shown) show that by early November the glacier had slowed down, returning to its normal speed. With the gradual release of the near-global Shuttle Radar Topography Mission and data from other sources, digital elevation maps (DEMs) will revolutionize our approach to the visualization and mapping of glacial landforms. This case study presents reconnaissance mapping of glacial bedforms from DEM data of Ireland, to provide a simple overview and highlight the utility of the approach, guiding future work. It complements and extends detailed bedform mapping completed by Clark & Meehan (2001) and Dunlop (2004). The DEM used for this case study was created by the Landmap project (Kitmitto et al, 2000) using European Remote Sensing (ERS) tandem pairs from space-borne radar (synthetic aperture radar—SAR). With a spatial resolution of 25 m, the DEM is capable of resolving lineaments, although detailed morphology and smaller forms are difficult to distinguish. The DEM visualization was performed using locally based contrast stretches (a point where now vector velocity maps spanning multiple ice streams can be generated easily. Recent acquisition campaigns such as the Modified RADARSAT Antarctic Mapping Mission have provided extensive new data sets. After highly successful missions, many of the early generation of spaceborne SARs have ceased operation or are near the end of their operational life. Future advances will largely rely on the launch of new instruments with the mission parameters favourable for ice-sheet mapping. non-azimuth based visualization technique), supplemented with traditional azimuth based relief shading (Smith & Clark, 2005). Mapping was conducted by on-screen digitizing.